Kale is the new beef! I don't know that everyone would agree with that statement, but it's certainly a trendy vegetable. I see it on more and more on restaurant menus and rarely in chip form. There's no complaints from me. 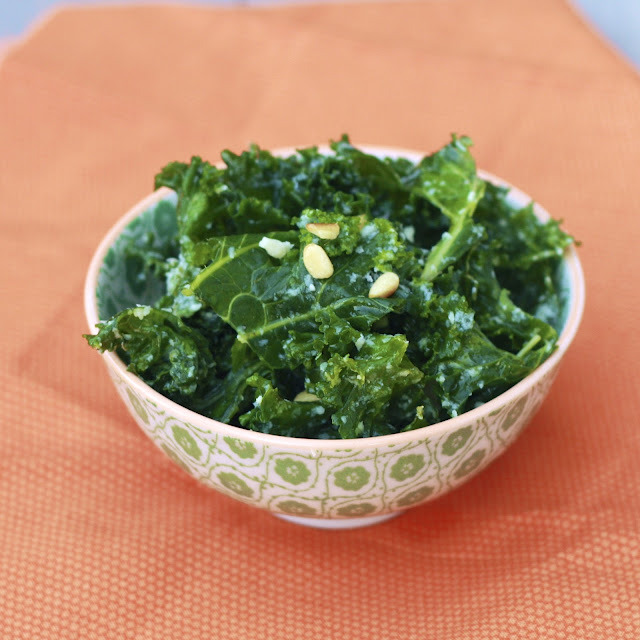 My love of kale is well documented on this blog! I recently declared that I prefer it over spinach. I love my spinach, I think I'm just a little burnt out and kale has been a nice substitute as of late. This is another wonderfully simple kale salad (for more check out this one with broccoli and sundried tomatoes, this one with brussels sprouts , and my favorite with craisins and apples!). I know people shy away from kale because it's so (admittedly) bitter, but it's amazing what a little massage with some vinaigrette can do. It sounds weird but it's easy--add the dressing and literally use your fingers to massage the vinaigrette into the kale. It'll break down the kale leaves a bit to make them softer and less bitter! The recipe below doesn't make a ton of dressing, but it was enough to lightly coat the kale and transform its flavor. If you prefer lots of dressing, you may want to double and add extra to taste. 1. In a small bowl, combine the garlic, lemon juice, white wine vinegar, salt, and black papper, whisking to combine. Allow to stand for at least 15 minutes. Whisk in olive oil and stir in parmesan just before serving. 2. 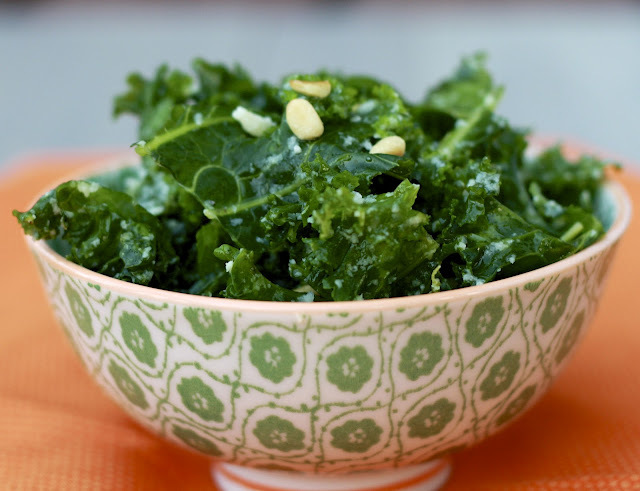 Toss dressing with kale and, using your hands, massage the dressing into the kale for a few minutes until kale begins to soften. Garnish with toasted pine nuts and shaved parmesan. Serve.